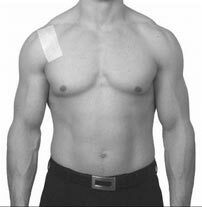 Your Shoulder Surgery: What to Expect? 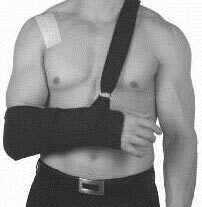 If someone is fitting the sling for you, support your operated arm with your elbow at right angles using your unoperated arm. Slide the sling in from behind so that your elbow fits snugly into it. Fasten the strap across your forearm, it should be approximately one inch below your elbow crease. Take the shoulder strap over the opposite shoulder and feed it through the upper ‘D’ ring. 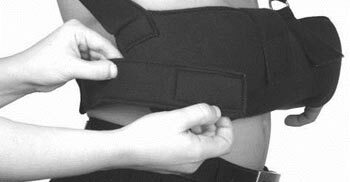 If you are wearing a body belt, feed the other strap through the lower ‘D’ ring and attach it onto itself with the velcro tab. 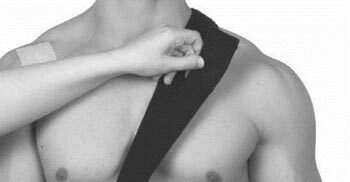 If fitting the sling without assistance, ensure that you are seated, with your elbow bent to 90 degrees (a right angle - see picture right). You will find it more comfortable if your arm is supported on a pillow. Attach the wrist strap inch from your wrist. The lower 'D' ring should rest against your body and the higher 'D' ring should face upwards. 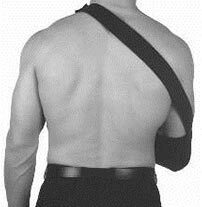 Take the body belt around your back and attach it over the front of the elbow section of the sling. Adjust as necessary so that your arm is held snugly against your body. 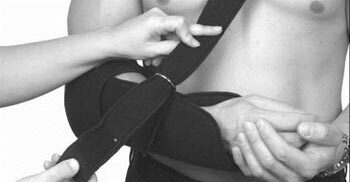 NOTE: It is essential that you regularly loosen or release the sling to exercise and move your elbow, wrist and hand to prevent stiffness of these joints. This should be done at least 4 times per day. GETTING WASHED: For the first 3 weeks you may need assistance to wash your un-operated arm, as you will not be able to use your operated arm for this. It may be possible to use either a cubicle shower, or an over bath shower. Please remember to keep the surgical wounds dry and protected whilst washing. Waterproof dressings may be provided by the hospital to wear when you are washing, alternatively these can be bought from a chemist. To dry yourself, it may be easier to put a towelling bathrobe on, which will help to dry your un-operated arm. GETTING DRESSED: You will find it easier to wear front opening clothes. Always dress your operated arm first. Sit on the edge of a chair or stand with your arm 'hanging' by your side. Slide your operated arm into the garment first using your un-operated arm. Do not assist with your operated arm, just let it hang loose. Once this arm is fully in the sleeve bring the garment around your back and put the other arm in. Any fasteners must be fastened only with your un-operated arm. 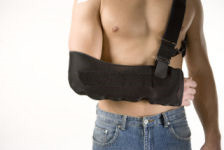 Once you have dressed your upper body, place your arm back in the sling. By 6 weeks after your operation you be able to have returned to dressing ‘normally’. FEEDING: For the first 3 weeks after your operation, you will feed yourself with your un-operated hand only. After this time you may return to feeding yourself 'normally' using both hands. This may differ for different procedures done by your doctor. TRANSFERING: This means getting in and out of your chair, bed and bath and getting on and off your toilet. For the first 6 weeks you must only push up from the bed, chair, toilet and bath using your un-operated arm. After 6 weeks you may return to using both arms as pain allows. SLEEPING: For the first 6 weeks your sling should be kept on while you are in bed. You may find it more comfortable to sleep on your back initially, with a pillow under your operated arm for support. You may also find it more comfortable to sleep in a semi-sitting position. KITCHEN ACTIVITIES: This includes making meals, snacks and drinks for yourself. 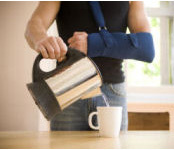 For the first 6 weeks you must use your un-operated arm for kitchen activities. After this time you may return to using both arms. AVOID LIFTING ANYTHING HEAVY FOR 3 MONTHS. At 6 weeks after surgery you may lift light items. HOUSEWORK: Light housework may resume after 6 weeks. More strenuous housework should be avoided until 3 months after your operation. STAIRS: When climbing/descending the stairs, hold the banister with your un-operated arm. This may mean that a second banister is required. After 6 weeks you may hold the banister with either arm. NB ALL THE ABOVE ARE GUIDELINES ONLY. IF YOU HAVE ANY CONCERNS OR ADDITIONAL QUERIES PLEASE CONTACT DR VAN DEN BERG. © 2019 Dr Charl van den Berg, Orthopaedic Surgeon. Website designed and hosted by Personalised Promotions in association with SA Medical Specialists. Sitemap.